Research papers on the war on the middle class discuss the phenomena that many believe is a real problem today. When examined from a sociological perspective, one can use Lou Dobbs' books to outline a thesis on how the American Dream is being stripped from the middle class today. Have Paper Masters custom write your research and outline the paper as you see it below. A typical theme is "War on the middle class and its affect on the American Dream". 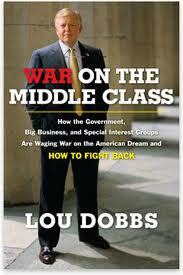 Political commentator Lou Dobbs has written a book entitled The War on the Middle Class and is angered at the lack of aid and resources that have been made available to the middle class of American society. The Clinton administration fired the first shot with the passing of NAFTA in 1993. (Dobbs 96) Though it had been drafted during the administration of George H.W. Bush, it was not passed until the William Clinton took the bill before congress again in 1993. NAFTA opened the borders between the United States, Canada and Mexico to form an open and free trade union. While the intent was increase the manufacturing of all three nations, what transpired was described as “a great sucking sound” as many hundreds of thousands of American jobs left the United States for Mexico and Canada – where the costs of labor where far cheaper. This hit the Middle Class of the United States very hard, as the majority of jobs manned by those in the middle class are found in the manufacturing sector. The CAFTA agreement (Central American Free Trade Agreement) drafted and passed by George W. Bush further exacerbated the problems created by NAFTA. By opening the Central American countries to the benefits of a free trade agreement, the Bush administration effectively opened the doors for hundreds of American companies to continue to outsource American manufacturing jobs. Another problem that Dobbs focuses on in his book is the tendency of the George W. Bush Jr. administration to cater to the whims of staunch conservative groups and concentrate on issues such as gay marriage and abortion while the middle class American is starving and living without access to health care. This trend was best seen during the 2004 presidential election as one of the prime subjects that the Republican candidates centered on was gay marriage – during the same time when unemployment in the middle class was at its highest percentage in more than a decade. The bankruptcy reform bill passed by George W. Bush is another issue brought to the fore ground by Dobbs. The new regulations for bankruptcy, as stipulated by Bush’s new law, make it increasingly difficult for middle class Americans to climb out of the pit of debt. However, during the same time this bill was being written and discussed in congress, the national government was spending well beyond the annual allowances for the GDP – creating and extending the worst budget deficit and national debt in the history of all democratic nations. Another possible source: United States, Congress, House, Committee on education and labor. Title; Strengthening Americas middle class, finding economic solutions to help America's families. Hearing before the committee on education and labor. US House of representatives, one hundred tenth congress, 1st session. American Dream - the perception on the part of foreign peoples that America is a better place in which to live than is their homeland, the perception which has been an important factor in motivating people to come to this land. Discuss the American Dream as it existed in the 19th century and early 20th century and discuss also the way in which that dream—somewhat altered—exists in time present. The American Dream of today, while still potent, is something that has become more realistic than it used to be. Motivation to Immigrate - Various motivational factors enter into the decisions of people to leave their native country and journey to a new land seeking a better life. Thom Hartmann, a liberal radio talk show host, also wrote a book on the subject of the middle class. Screwed: The Undeclared War Against the Middle Class covers many of the same issues as the books written by Lou Dobbs; however, while Dobbs has been a life-long Republican, Hartmann has been on the other side of most issues. His liberal approach to the problem is oddly similar to that of Dobbs, however – indicating, perhaps, that the problem of the government’s war against the Middle Class is not just the rhetoric of a single political party, but members of the American intellectual community from all parties. According to Hartmann, the ability for the average middle class American worker to purchase a home, support a family and still have money for saving or health care is nearly non-existent. These things have been placed outside of the reach of the middle class worker by the “super rich” who wish to have the prestige of the complete comfort that their wealth affords. Hartmann states that the “conservative and corporate forces are waging a covert war against the middle class, dismantling policies like Social Security, Medicare, the minimum wage, and fair labor laws” in order to create a deeper rift between themselves and everyone else in the country. The safety and security that once was felt within the ideal of being “middle class” has been lost. In this day and age, the same feelings of fear and uncertainty are plaguing everyone who doesn’t make more than one hundred thousand dollars a year. While there is no concrete evidence that this failure of the middle class to maintain its level of security is the fault of a clandestine attack by the wealthy elite, history and current political rhetoric would certainly offer the possibility. Book source: Author: Dobbs, Lou. Exporting America : why corporate greed is shipping American jobs overseas. New York: Warner Books, 2004. George Bush - George W. Bush essays on the 43rd president who came into office in January 2001. Presidential Elections - Presidential Elections research papers discuss the aspects of an election, such as the electoral college. Deficit Spending - Arguments against budget deficits hold their own substantial weight, especially in light of the current Asian crisis. House of Representatives - House of Representatives research papers write on Congress and the representative leadership within government. Immigration - Immigration research papers discuss the problem of immigration in the United States. U.S. Federal Government - U.S. Federal Government essays examine the three branches of government as outlined by the Constitution: the Executive, the Legislative and the Judiciary. Social Security Income - Social Security Income Research Papers look at a sample of an order placed on a social policy or program in the United States. Privatization of Social Security - Privatization of Social Security research papers look at all sides of the issue of privatization. Social Security Privatization - Custom written research papers on the privatization of the social security system. Order a research paper on social security from Paper Masters. Social Security Law - Social Security Law research papers examine the law that was developed by FDR to help the United States recover from one of the most profound economic downturns in American history. Bush Tax Cuts - Bush Tax Cuts Research Papers discuss the tax cuts that were passed in 2001 and are to expire in 2010 if not extended. Roughing it in the Bush - In short, the journey to Canada has left many from the lower class to believe that they were worthy of the same privileges and luxuries of the middle class. Cultural Deviance Theory - Of course, individuals who are normally considered middle-class or upper-class may certainly experience periods of unemployment. Paper Masters writes custom research papers on War on the Middle Class and examine its affects on the American dream, with a specific source requirement.